FaceWorks is a middleware library I built at NVIDIA in 2013–2014. 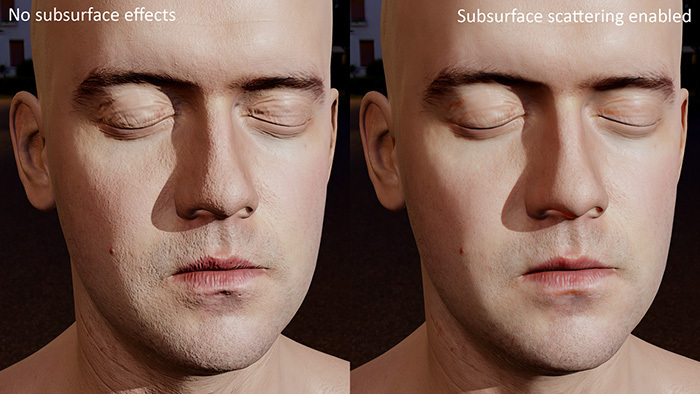 Its goal is to enable game developers to add high-end skin and eye rendering to their game engines. It was still a work in progress, but at the time I left, FaceWorks included an efficient, one-pass subsurface scattering implementation based on Eric Penner’s 2010 SIGGRAPH paper Pre-Integrated Skin Shading, as well as an implementation of “deep scattering” (translucency), based on estimating the thickness of a model from a shadow map. This talk gives a high-level overview of how FaceWorks’ rendering features operate, how it can be integrated into a game engine, and the roadmap for future development.